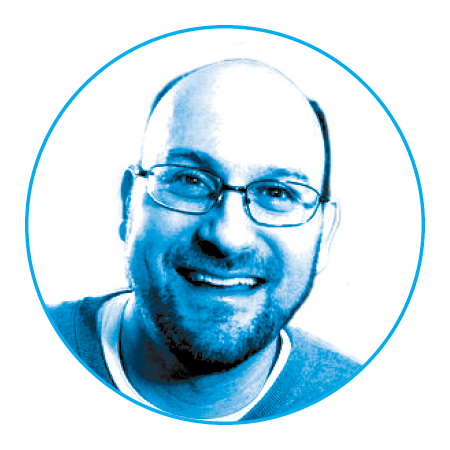 Weckstein is an avian evolutionary biologist who serves as associate curator of the Ornithology Department at the Academy of Natural Sciences of Drexel University and as an associate professor in Drexel’s Biodiversity, Earth and Environmental Science Department. Rice is the collection manager for the Academy of Natural Sciences’ ornithology collection. No institution in the Americas has as rich a history of international field collecting in ornithology as the Academy of Natural Sciences of Drexel University. For over two centuries, the Academy has sent ornithologists to vanishing wild places to survey and sample local bird populations. 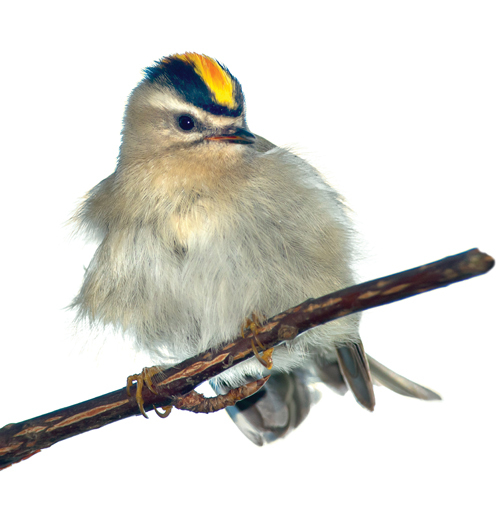 The golden-crowned kinglet (Regulus satrapa) is a species that can be found outside the Academy’s doors in Philadelphia. Although tiny, it can survive in cold, wintry environments, eating insects and insect eggs. Weckstein said he plans to compare this subspecies collected in Mexico with its counterparts from North America currently housed in the Academy’s collection. Recently, Academy scientists Jason Weckstein and Nate Rice, the assistant curator and collection manager of the Academy’s Ornithology Collection, respectively, traveled to Parque Ejidal San Nicolás de Totolapan, a protected reserve about 20 miles southwest of Mexico City in Mexico. There were many reasons this location was selected for a collecting expedition, but one in particular demanded attention — it was time. To “process a bird,” ornithologists follow a certain order of steps. 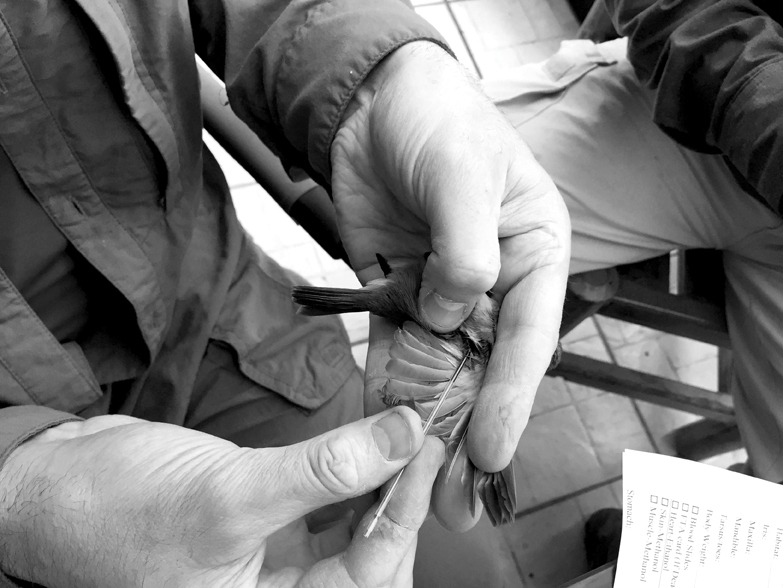 Here, Weckstein works with Erick Alejandro García Trejo, a professor in the department of evolutionary biology at the National Autonomous University of Mexico (UNAM), to prepare a bird for the collection. First, birds are captured in a mist net, which is a fine mesh suspended between two poles, like a volleyball net. 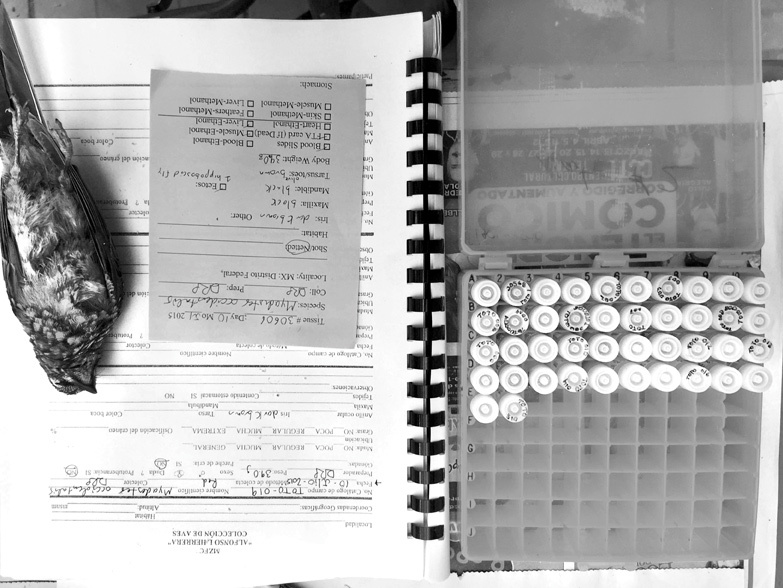 The scientists then record the bird’s weight, measurements and coloring; take a blood sample; make a blood film (a smear of blood on a slide, used later to look for blood parasites); euthanize the bird; “ruffle” the bird by placing it in a bag with a cotton ball of ethyl acetate to euthanize any parasites that may be living on its skin or in its feathers; ruffle the bird’s feathers to shake out parasites and other debris; and skin the bird to prepare it for study. 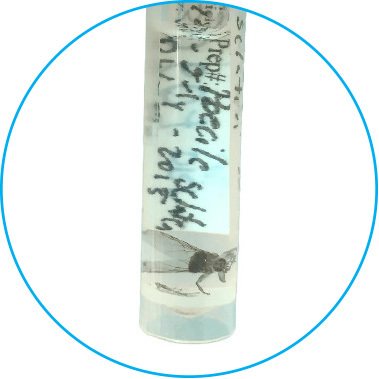 At the bottom of this vial is a hippoboscid fly collected from a bird. Hippoboscid flies are one of the groups of avian parasites that Weckstein’s lab is studying. Weckstein will use the collected flies to determine their levels of host specificity — that is, how dependent the parasite is on a single host. The dogma in the science literature says that hippoboscid flies are generalists that feed on many hosts, yet this has never been rigorously tested. This is important data because these flies are vectors for Haemoproteus, a relative of malaria, and they also move lice and mites between avian hosts. 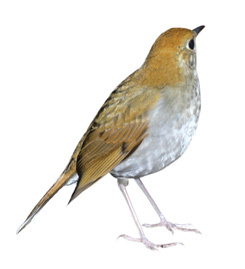 Weckstein and Rice brought back specimens of a russet nightingale-thrush (Catharus occidentalis), which will be used by environmental science doctoral student Matt Halley to study the genus Catharus. Halley is sequencing the DNA of the specimens using tissue samples, and then comparing these sequences to help determine how many species there actually are. He is also using DNA sequences to reconstruct the family trees of all species of Cathrus thrush. It turns out, Halley says, there are some cryptic species that have long been overlooked — he’s gathering evidence to make the case (for or against) revising the taxonomy by adding or subtracting species. The pair worked with long-time collaborators from the National Autonomous University of Mexico (UNAM) for a 10-day trip along the thick forest terrain of the park. At roughly 3,000 meters above sea level, the air was thin, the nights cold and the mornings foggy, but it was all worth it for the “gold mine” of material brought home to the Academy. 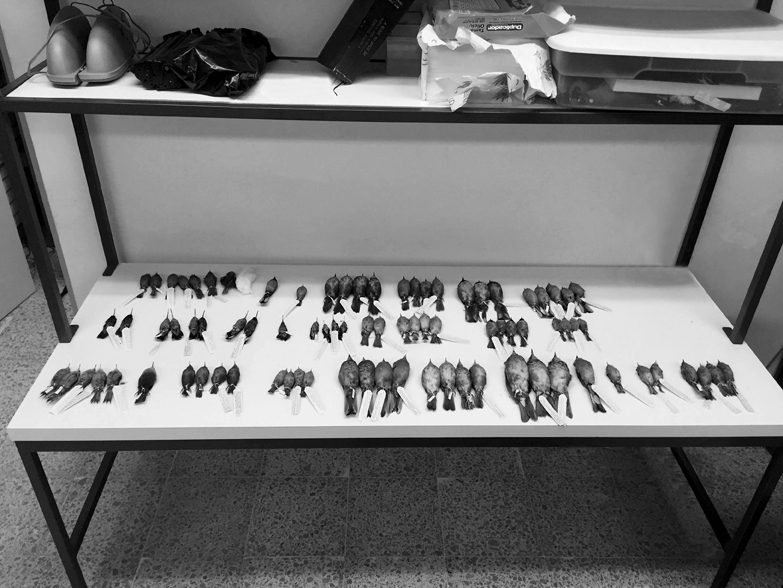 The team has several projects in progress already with the Mexico specimens — Rice has been filling in gaps in the Academy’s Ornithology Collection, which consists of study skins and tissue samples (and one of the world’s best collections of avian parasites, since Weckstein’s arrival in 2015). Weckstein plans to study the hippoboscid flies collected from bird specimens in the field to learn more about which birds the insects are feeding on. He is also conducting malarial screening on the tissue and blood samples from the trip. Host countries set limits on how many birds of each species can be collected during field expeditions. On this particular trip, the team was allowed five per species. The one exception was the allowance of seven specimens of one particular species designated by the Academy for close study, the red warbler (Cardellina ruber). And for the specimens that may not be of immediate scientific use, each day that passes makes them more historically valuable to the scientist who will surely come looking 100 years from now. 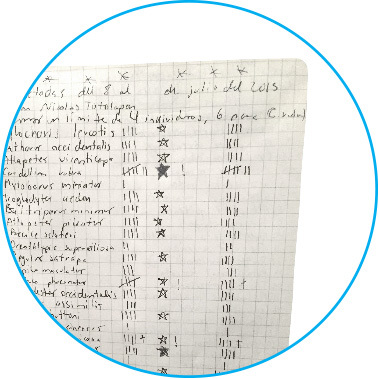 This image highlights one of the most important steps in the collecting process: recording scientific data. The data sheets follow a specimen through the entire process from how it was caught, to its weight, to the coloring of its eyes, bills and legs, to what parasites were present on its body. The vials contain tissue samples and blood samples, both of which will be used for various projects. For example, Weckstein and his team will examine the blood for malarial parasites (Plasmodium, Haemoproteus and Leucocytozoon, for example). He’ll screen individual birds for these infections and then sequence DNA from those pathogens infecting birds to characterize their diversity, host specificity, distribution and evolutionary history. 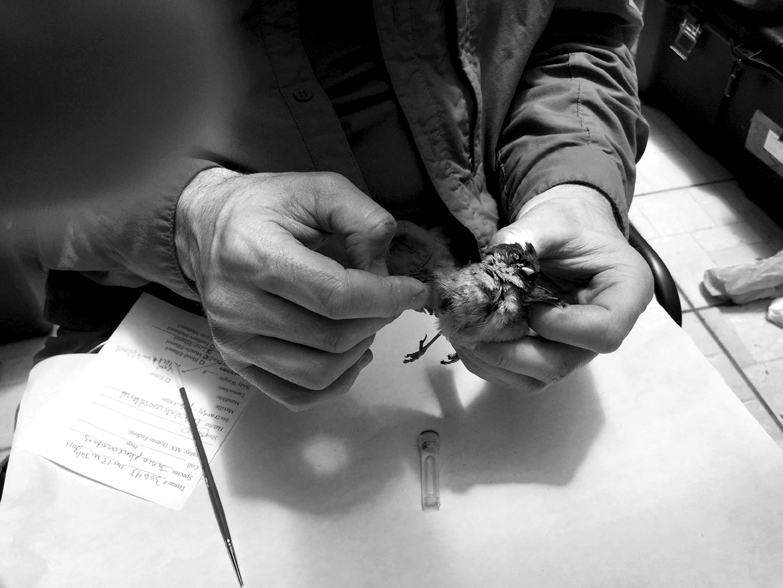 Nate Rice has been preparing, or “skinning,” birds for decades. He is an artisan of sorts, and takes pride in his craft. After a bird is euthanized and all of its data collected, the next step, Rice says, is to open the bird along the chest, pull the skin back and remove all muscles, bones and organs. The same goes for the head — the neck is turned inside out to remove most of the skull as well as the brain and eyes. Lastly, the skin is filled with cotton and stitched back up. The goal is to make the bird look as it did in life. Rice can make a robin-sized skin in 20–25 minutes; on the Mexico trip, he prepared about 10 specimens per day. Though they’ll never sing again, these birds will speak to scientists well into the future about the genetic, evolutionary and geographic changes influencing their species. The researchers from the Academy and those from the National Autonomous University of Mexico each took an equal split of the specimens, taking into account whose research interests centered around which birds. In addition to what can be seen in the photo, each team also took blood and tissues samples back to their home institutions. 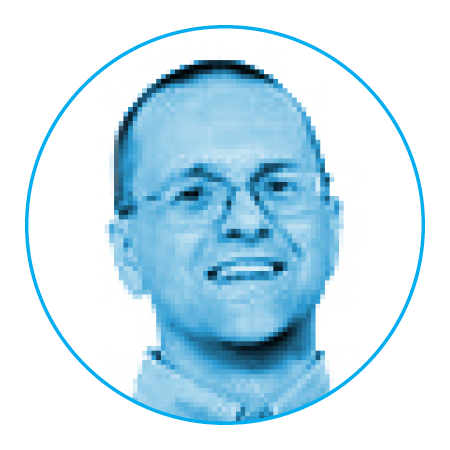 “This material will absolutely benefit a whole slew of projects,” says Weckstein.